Global climate change linked to meso-scale environment modifications such as regional above average precipitations, stronger El Niño-ENSO warm phase, global warming, permafrost degradation, and glacier retreatment could promote slope instability. However, which of these mechanisms is leading landslide activity in the high mountain landscape of Central Andes is still uncertain. Otherwise, changes of landslide features as consequence of these climate drivers is rare approached so proposal of effective preventive measures is not viable. The main concern of this research is to elucidate whether climate change is driving more frequent slope instability in the Central Andes. We focus on two key questions of our research: (1) Which landslide features are changing due to climate change? and (2) Which climate change mechanisms are certainly forcing landslides generation in the Central Andes? 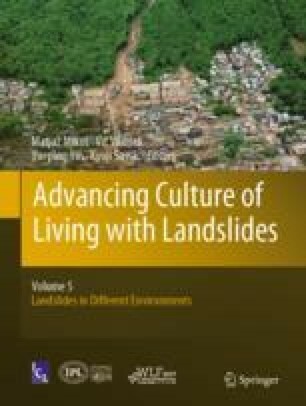 Our findings explain how the global environment change is shifting slope behavior in the Central Andes increasing landslide frequency and intensity, modifying landslide spatial distribution, shifting initial points of slope instability to higher topography, and generating more complex landslides. Main explanation for this shifting on slope instability behavior is intensified summer rainfall and global warming. This research was founded by PIP 484, PIP 11220150100191 (2015–2017) and ANLAC (Natural Hazards in the Central Andes) Program founded by UNCU University leader by Stella Moreiras. We are gratefully to D. Araneo for discussion of results.